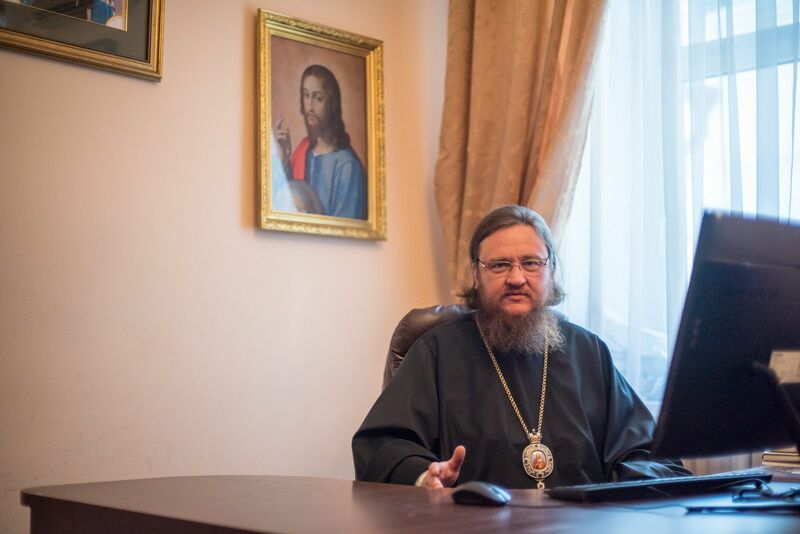 Today we will cover these topics in our discussion with the Archbishop Theodosy (Snigiryov), of Boyarka, a vicar of the Kiev Metropolia, and one of the main speakers of the Ukrainian Orthodox Church during the Anniversary celebrations in Kiev, 2018. Archbishop Theodosy (Snigirov) of Boyarka. —Your Eminence, the first question is very important in the context of the recent celebration (The Baptism of Rus’), and in general, events concerning the Ukrainian Orthodox Church in recent years: How deep is the connection between the Ukrainian Church and the Moscow Patriarchate both throughout history and current times? Are the Ukrainian and Russian Churches really different, almost “warring” amongst themselves, as the schismatics say? —Certainly not! The connection was and is very deep; historically and spiritually. We have always, for millennia, been one Church! From the Kievan baptismal font in 988 arose the Russian church, which spread the Gospel faith and church life throughout the territory of what was then Rus’. After all, the very same Holy Prince Vladimir of Kiev, like his grandmother Equal-to-the-Apostles Saint Olga, was born near Pskov, and was later the Prince of Novgorod, [Pskov and Novgorod are medieval cities now located in western and northern Russia.—Trans.]. 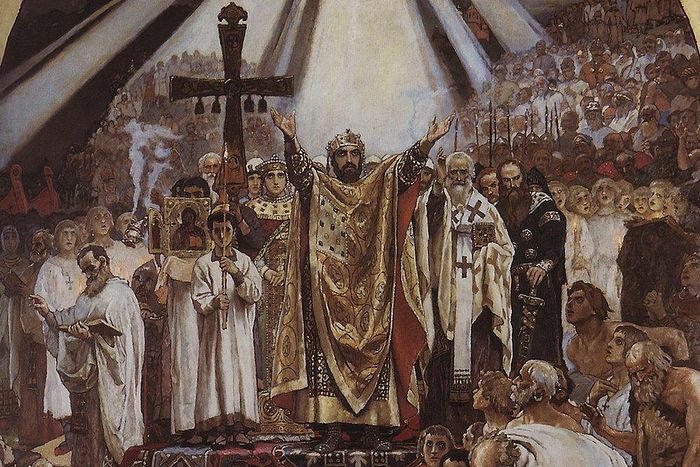 He fought for the Orthodox faith, and it spread to the north, south, east, and west—across all Rus’. "The Baptism of Rus'", 1896 a fresco by V. m. Vasnetsov, in the Cathedral of St. Vladimir in Kiev. A painting by the same name, painted in 1890 and preceding the fresco, is preserved in the Moscow Tretyakov Gallery. The Ancient Russian Church was then, in terms of canonical status, part of the Patriarchate of Constantinople. Later, in connection with the wars and desolation [of Kievan Rus’.—Trans. 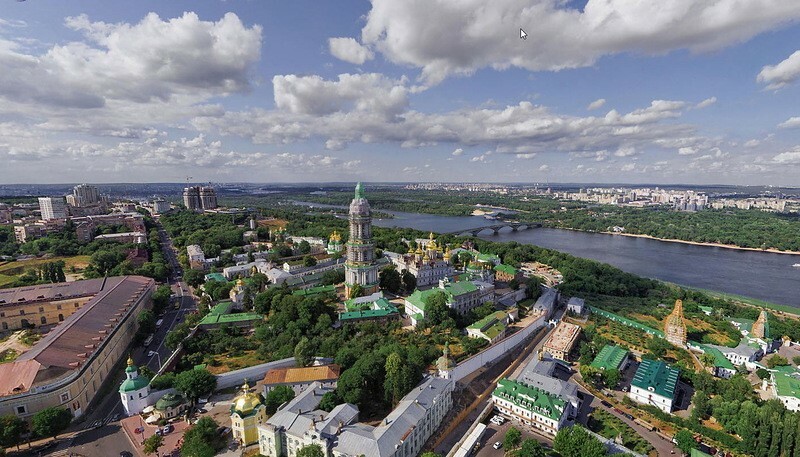 ], the residence of the Metropolitan of Kiev and All Rus’ was moved to Vladimir-on-Klyazma [located in central Russia.—Trans. ], and subsequently to Moscow. The transfer of the administrative center of the Kiev Metropolis was officially approved by the Patriarchal Synod of Constantinople. Then in the fifteenth century, as a result of historical events, there was a temporary separation of the Western Russian Metropolis, along with Kiev, from the rest of the Russian Church. The division lasted almost 230 years, and in the seventeenth century, unity was again restored. So spiritually speaking, we have always been one Church. Administratively, things were a little different. In modern times, after the collapse of the Soviet Union, and the formation of an independent Ukrainian State, the Ukrainian Orthodox Church became independent, and received rights of broad autonomy, and full independence in its administration. In fact, our Ukrainian Church has received rights the likes of which had never been seen before in history. At the same time, the Ukrainian Orthodox Church remains in full spiritual and canonical connection with the entire Russian Church. —In light of what you have said, the question arises that is often asked by Ukrainian schismatics: Why is the Moscow Patriarchate the Mother Church for Kiev, and not vice versa? After all, there was no Moscow during the Baptism of Rus’. And Constantinople constantly repeats that it is the Mother Church for Ukraine. — Schismatics, as usual, are using their traditional logical fallacy of equivocation (substitution of concepts), banking on the ignorance of whoever is listening to them. In Church-legal terminology, the “Mother Church” (or Kyriarchal Church), is the Patriarchate or Local Church which currently encompasses or includes a given canonical and administrative Church territory. This does not mean the Church from which another [Church or nation.—Trans.] received the Orthodox faith. By that logic, the Mother Church of the entire Orthodox World would be the Church of Jerusalem, but this is not so. Patriarch Kirill of Moscow and All Russia at the celebrations of the 1025th anniversary of the Baptism of Russia, Moscow, 2013. And for Ukraine, the Mother, or Kyriarchal, Church today is the Russian Orthodox Church, whether someone likes it or not. Even if, theoretically speaking, we consider the transfer of the Western Russian Metropolis, which is now contested by some historians from the Phanar [Ecumenical Patriarchate.—Trans], this does not change anything. Canon law dictates a period of thirty years to confirm the canonical subordination of a given territory to a certain bishop, upon the fact of this subordination, without subsequent polemics. This is so that there will not be unrest and instability in the Church. And it’s already been more than 300 years since this happened. What is unrecognized? What are they talking about? It seems that some “theologians” do not see anything beyond their office walls, let alone look out the window. —Remind us, please, in numerical terms how great is the Ukrainian Orthodox Church today: How many parishes, priests, believers are in it? — The Ukrainian Orthodox Church is the largest religious confession in Ukraine. It includes 12,500 parishes, more than 250 monasteries, 12,000 priests, and more than 5000 monks and nuns. By comparison, all the remaining “Orthodox” confessions of Ukraine taken together have about 5000 parishes and a little more than 200 monks and nuns amongst them. As for the number of believers in the Ukrainian Orthodox Church, I think it is in the many millions. But this number does not lend itself to an exact calculation; statistics of this kind are not kept. At the festive Cross Procession in Kiev [held by the canonical Church.—Trans. ], which gathered around 250,000 believers, you can draw some conclusions. After all, the majority of believers can’t participate in the procession, only a few from all the dioceses can make it. If we consider that not everyone was even able to make it to Kiev, or even organize transit, due to obstacles imposed by the authorities in all regions at different levels…then here we have this “small” crowd of believers, “only” 250,000 who gathered in one day, in one city. —Our opponents refer to the opinion polls and statistics, in particular, the testimony of the Center for Political and Economic Research Razumkov, who, as is well known, serves the interests of anti-Russian political forces in Ukraine. —Firstly, the results of separate opinion polls differ diametrically, sometimes showing the opposite. And secondly—and this is important—no sociological surveys give an objective picture of the religious life of the country. They do not say anything about the number of practicing believers. After all, this is supposed to be a religious picture. They do not operate with statistics about the fulness of parishes and monasteries, but only give a spectrum of preferences, of let’s say “televiewers”. Not real believing people, but everyone grouped together. Polls were conducted among respondents who do not even know with which hand to make the sign of the cross. But they know very well what they were taught on television: which Church is right, and which is “the enemy”. In fact, the real indicators of the number of believers in a particular confession are its parishes, monasteries, priests, monks, and nuns. That which we talked about above. —During the last few months the theme of granting a “Tomos on the Autocephaly of the Ukrainian Orthodox Church” was raised by Ukrainian politicians and discussed in the press. By appealing to the Patriarch of Constantinople, President Poroshenko and the Verkhovna Rada violated the separation of Church and state, as defined in article 35 of the Ukrainian Constitution, did he not? —Yes, that goes without saying! These attempts to interfere in the religious life of society demonstrated by political figures of Ukraine can be called unconstitutional. And it is not only the infamous appeal [of President Poroshenko], of which you are speaking. Following him, many officials of different ranks each according to their station, calling to action to work on this issue: diplomats, district and provincial leaders, etc. —The uninformed in Church matters so argue: What is wrong with the initiatives of the politicians? What is wrong with Ukrainian having her own autocephalous Church? Ukraine already has her own church; absolutely autonomous, and the most populous—this is the Ukrainian Orthodox Church. The opportunities and rights of our broad autonomy are much grater than even those of many churches with an Autocephalous status! This is an objective and important fact: the rights of autonomy of our Church are much greater than those of many autocephalous Churches. And the majority of the believers of the Ukrainian Orthodox Church understand this; they understand and appreciate it. But at the same time, they appreciate the spiritual unity with the fullness of the Russian Church, founded by St. Prince Vladimir, as we have already said. At this historical state, the overwhelming majority of the episcopate, the priesthood, and the lay people of our church are satisfied with its canonical status, and do not want to initiate changes. I am certain that the people of God will give no one the ability to use the Church as a bargaining chip in political games. We are told that autocephaly will relieve internal tension and resistance from the schismatics, that it will heal the schism. They say that they will return to the bosom of the Church. But this is deception. No form of autocephaly will heal anything, everyone needs to understand this perfectly. 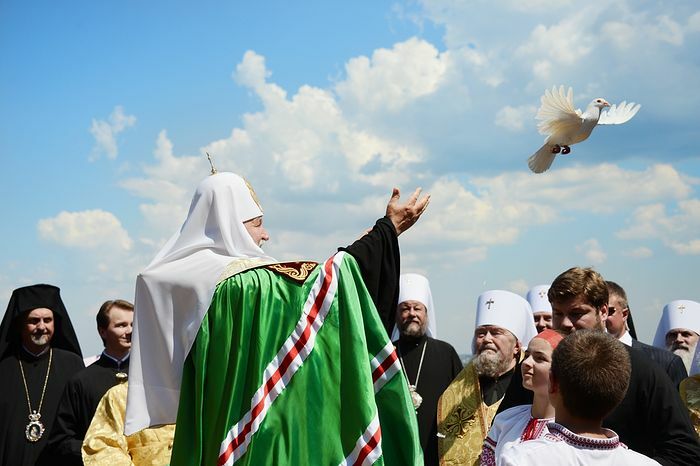 Repentance is needed for the healing of schism in Ukraine, not autocephaly; awareness of one’s own ecclesiological errors, the replacement of their “sacraments”, the canonical ordination of their “priesthood”. Are they really ready for this yet? On the contrary, we hear from the side of the schismatics increasingly aggressive rhetoric about the seizure of lavras, churches, etc. But [healing the schism.—Trans. ]—that’s not what this is really about. It must be understood that the initiative of politicians to “provide autocephaly” has no direct relationship to the canonical and most populous Orthodox Church in Ukraine. This initiative is all a thinly veiled desire for the non-canonical, summary legalization of Ukrainian church schisms, namely the so-called “Kiev Patriarchate” and the “Ukrainian Autocephalic Orthodox Church”. That is what all this talk is about, simply masked with some kind of “Tomos of Autocephaly”. In the question under consideration, an equivocation fallacy is laid. The Kiev Patriarchate does not need any “autocephaly”—that is to say, independence. The “autocephalous Churches” aren’t dependent on any Church as it is [because they aren’t even recognized as lawfully Orthodox in the first place.—Trans]. This structure [the Kiev Patriarchate.—Trans.] does not need autocephaly, but rather legalization in the international Orthodox community. That’s what they so desire. But at the same time, they do not want to enter through the door, they want instead to climb over the fence. —All said, what if Patriarch Bartholomew unilaterally still decides to legalize the Kiev Patriarchate? —If the question is whether Patriarch Bartholomew will break the canonical order in the Church for the sake of legalizing Ukrainian schisms: The latest information from inter-Orthodox consultations and meetings on this issue shows that the Patriarch understands the entire complex issue of the Ukrainian problem. And it is unlikely that he would want to take responsibility for the unpredictable consequences of this step. In this regard, there is great hope for the meeting of the Most Holy Patriarchs Kirill and Bartholomew, which is planned for the end of August. Knowing the wisdom, canonical firmness, and diplomatic experience of our Patriarch, I share the hope of the Ukrainian flock that this meeting will not only relieve tensions on the Ukrainian issue, but will also bring about a general warming and constructiveness to inter-Orthodox relations. —God Grant that it will be so. 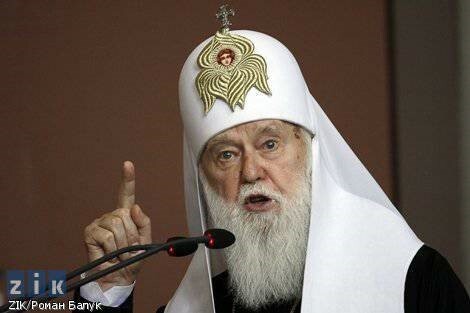 But in his interview, Philaret [Denisenko, the “patriarch” of the “Kiev “Patriarchate”.—Ed.] already spoke about how the Kiev Caves Lavra, Pochaev Lavra, and other holy places should be “expropriated” from the Canonical Church. 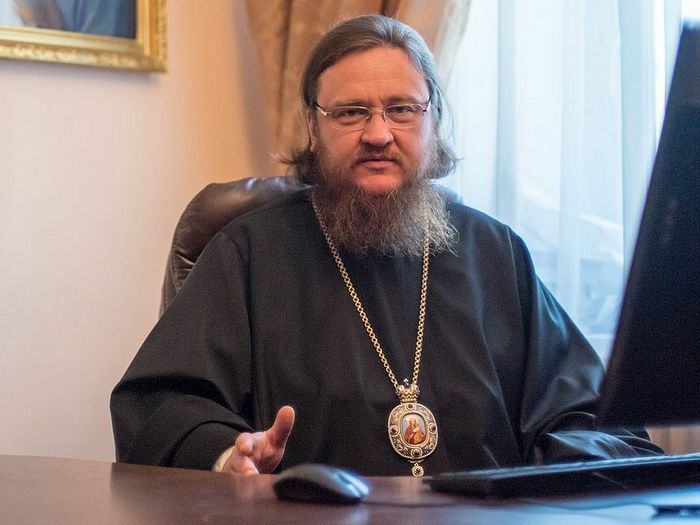 —Absolutely, in his recent interviews, the leader of the “Kiev Patriarchate” Philaret constantly repeats that in the circumstances of the canonical legalization of his organization, they will claim the property and the very name of the Ukrainian Orthodox Church. And this will attract Ukrainian legislators, officials, politicians. Anti-Church bills have already been prepared in the committees of the Verkhovna Rada to help church raiders to implement these plans. And what can this lead to? I am afraid that this could become the trigger for a full-scale civil confrontation on religious grounds. It seems to me that this is obvious to any sensible person. —Philaret, however, cunning as ever, in a recent statement denied that the monasteries of the Ukrainian Orthodox Church will be captured by force. —Yes, he tried to take it back; apparently he must have been told he spoke too soon and risked damaging the plans. And how did he support his refutation? With his “honorable” word alone? But if one could believe his word, then there would have been no schism in Ukraine in the first place (remember his Archpastoral word on the cross and Gospel to leave office and not bring trouble in 1992)? What else? Reflections about how all believers will suddenly come together and freely and voluntarily join the Kiev Patriarchate? We have already seen this in Western Ukraine, where believers are expelled from churches that they themselves built, in total disregard for the decisions of the courts. And in the face of this, they say, “Everything was free and voluntary.” These are all fairy tales for television viewers. I think Philaret understands perfectly well what he wants to do and how he plans to do it. God is not in power and hatred but in truth and meekness. Our flock hopes and believes that politicians and schismatics won’t be able to take these self-destructive steps. If it comes to that, believers will protect their holy places as they are able. —And what if they can’t? —Even if one assumes that someone is planning a full-scale persecution of the Church in Ukraine, as it was the case with the Communists, the believers still have no reason to loose spirit. As the folk proverb says: God is not in the wood of the church but the hearts of believers. We will pray in homes as we did in ages past. But we should always remember: With the help of God, the Church will stand and the gates of hell will not prevail against Her (Matt. 16:18). Moreover, we know that Kiev is one of the protected places of the Mother of God, and we believe that she will not allow believers more trials than they can bear. I still think that it won’t come to a forceful confrontation. —The Ukrainian Orthodox Church is now in a difficult position: The Russian Federation has been declared in Ukraine as an “Aggressor state”. Nevertheless, the Ukrainian Orthodox Church maintains a canonical connection with the Moscow Patriarchate. How loyal is the broader Ukrainian society to the believers of the Ukrainian Orthodox Church? —It is not only the Ukrainian Orthodox Church that is in a difficult situation, but rather the entire Ukrainian nation. And believers, as part of this nation, are no exception. But unlike other faiths of Ukraine, our Church represents the whole country in all it’s diversity. It really embraces the whole of Ukraine from Krai to Krai [edge/border] And like no other confession, the sum of its believers represents all regions without exceptions. Therefore, our Church as a community of believers from all regions perfectly understands that the problem of war in Ukraine cannot be narrowly reduced to a “war between the two countries”. The problem is much broader and more global. It is justly said by Ukrainian sociologists, that in our country, and not only on the front line, there is a confrontation going between two different worldviews, two different mentalities, two different public self-identifications—pro-Western on the one hand, and pro-Eastern, pro-Russian, if you will, on the other. For a very long time, both of these primary thought groups of Ukrainian society have lived peacefully, considered and called themselves Ukrainian, and built our country on the basis of parity. Over the Baptismal Font of Rus'. The Kiev-Caves Lavra. In general, in Ukraine, as a multi-ethnic and multi-faceted state, there exist other significant public factions with their historical memory and worldview. And this diversity has never been a problem before. We always formed a single Ukrainian society, multifaceted, but calm and peaceful. And of course, absolutely, there was and still is present unto this very day the Ukrainian Orthodox Church. Millions of our believers pray and build monasteries and churches from Transcarpathia to Donetsk and Luhansk, from Chernigov to Simferopol. Pay close attention: The Ukrainian Orthodox Church is the only public institution in modern Ukraine which managed to survive in these difficult years structurally and territorially unscathed. The secret is simple. The Church does not divide but unites. It does not inflame confrontation and hatred, but on the contrary, seeks to extinguish it and calls for peace. Grant that all parts of Ukrainian society live and develop freely and calmly, and then we will all be peaceful and well in our common home. This is how the Ukrainian Orthodox Church thinks and acts. If politicians were to act this way, the tragedies of today’s times could be prevented. —Your Eminence, what do you think: Is it a long way until real peace can be established in Ukraine? —I think that all external factors of the conflict will lose force if our internal contradictions are resolved; if Ukrainian society becomes one not only in words, but in reality. And unity for Ukraine is possible only in diversity. That is how it came about in history, and nothing else can be done about it. To achieve this unity in diversity, it is necessary to avoid radicalization of society, and the incitement of hatred on national and religious grounds. It is necessary to strive for dialog and respect for different points of view and mutual forgiveness. I believe that such a path could lead in the foreseeable future to reconciliation and finally to the end of the conflict. http://www.patriarchia.ru/db/text/5082273.html the official charter of the Moscow Patriarchate on the status of the Ukrainian Orthodox Church.—Trans. Equivocation: an informal logical fallacy, essentially substituting two separate concepts out of context. For example: Saint George was made a saint and he was a solider, therefore being a solider is a good way to become a saint. Also, Saint John is called “of Shanghai” Shanghai is a city in China, therefore Saint John is Chinese. It is also often tied to the dual meaning of a word, or intentionally misinterpreting a duel meaning in order to deceive people.—Trans. https://www.youtube.com/watch?v=fr84d6Ym4Do&feature=youtu.be&t=8m22s In this video, Ukrainian schismatics in their procession can be heard chanting “Ukraine above all others” an analog of the Nazi saying: “Deutschland über alles”, as well as “death to enemies”.—Trans. At a meeting of the Holy Synod of Bishops in 1992, Philate Denysenko swore on the Gospels that he would not break away from the canonical Church. Upon his return to Kiev, he declared himself “Patriarch” of the “Kiev Patriarchate”, for which he was anathematized by the Moscow Patriarchate.—O.C. The Church must conduct pastoral work for the care of souls, pray, and make peace between people; but under no circumstances must it serve one or another political view, position, or concept.” This allows the Church to remain outside of a conflict, and carry on its work of bringing peace between the conflicting sides.